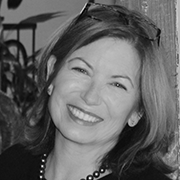 Ask Dr. D'Adamo: What Are the Benefits of Probiotic Supplementation? Every day, we read something new about the microbiome, that teeming pool of microorganisms in our digestive tracts. Understanding all the information out there, and more importantly, knowing what to do with it, makes a difference in optimal gut health and overall wellness and vitality. Just as no two fingerprints are the same, no two intestinal tracts are the same. People of different blood types have different gut bacteria, and the foods we eat can influence the growth of good bacteria or problematic bacteria. Eating "right for your type" supports and encourages overall digestive system, healing and building a strong healthy microbiome. In this issue, we have some great info on the microbiome and blood type, which we hope you will find helpful. Happy reading and happy August. There are millions of bacteria and yeast living in your digestive tract, known as the microbiome. The different kinds of microbes are usually in balance with one another, preventing any one type of germ from overgrowing and causing disease. Cultured foods and probiotic supplements provide additional "friendly bacteria" to help restore intestinal balance. What does this have to do with Blood Type? 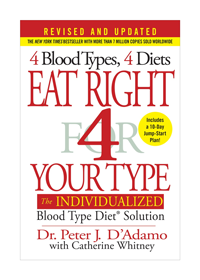 Blood type antigens are not only found in your blood stream; they're also found in your digestive system. Many bacteria in your GI tract eat these blood type antigens. Other types of bacteria secrete substances that act against your blood type, so those strains should be avoided. 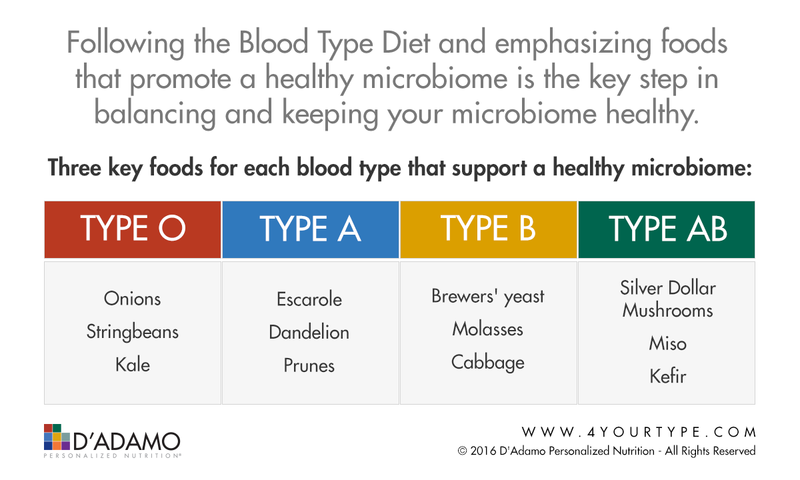 This is why people of different blood types have different bacteria found in their microbiomes, and there is no "one size fits all" protocol for building a healthy microbiome. Friendly bacteria produce a wide array of antibacterial and antifungal compounds, which kill some pathogens directly. They also produce substances, which regulate the body's own immune system; stimulating the immune system when necessary, and calming it down when there's auto-immune activity. Good germs promote detoxification by breaking down and eliminating carcinogens, enhancing liver function and cholesterol metabolism. They also regulate the production of many kinds of enzymes that help the body break down toxins. Some bacteria produce enzymes directly, while others produce substances that speed up or slow down the body's production of enzymes. Healthy gut flora helps to fully break down foods into their component parts, reducing the chance of reactions. A healthy microbiome reduces gut permeability, so fewer undigested proteins are able to enter the blood stream where they can cause problems. Bacteria can also break down lactose, reducing symptoms of lactose intolerance. Aging, poor dietary choices, stress, and antibiotic/drug use or over-use can cause the quantity of your bacteria to decline over time. There are three things that impact your gut's well-being and protect your gut bacteria—your diet, your fiber intake, and the availability of short chain fatty acids in your gut. Short chain fatty acids are produced when bacteria break down fiber, and they're also found directly in some foods such as butter, ghee, and some cheeses. These short chain fatty acids provide energy to colon cells. Healthy, well-nourished colon cells secrete substances that promote the growth of good bacteria. Additionally, supporting your microbiome health by supplementing with probiotics specifically designed for your Blood Type provides the additional support needed to balance and nourish your gut bacteria. 1. Excerpted from The 20th Anniversary edition of Eat Right 4 Your Type by Dr. Peter D'Adamo with Catherine Whitney to be released in January 2017. What Are the Benefits of Probiotic Supplementation? Q: I've been reading a lot about probiotics lately. I noticed that you have four different probiotics – why? Do I need to take a probiotic every day? What are the benefits of taking your supplements as opposed to another probiotic – or just eating yogurt? A: The term "probiotic" means "in favor of life". It was coined in 1910, by a Russian physician named Metchnikoff, who promoted a theory of longevity that associated prolonged life and improved health with decreased gastrointestinal toxicity. He suggested that the aging process could be slowed with fermented foods that contain friendly bacteria. At the time, blood type wasn't understood, however, further research has found that your blood type antigens are actually prominent in your digestive tract and, in about 80% of individuals (secretors), are also prominent in the mucus that lines your digestive tract. 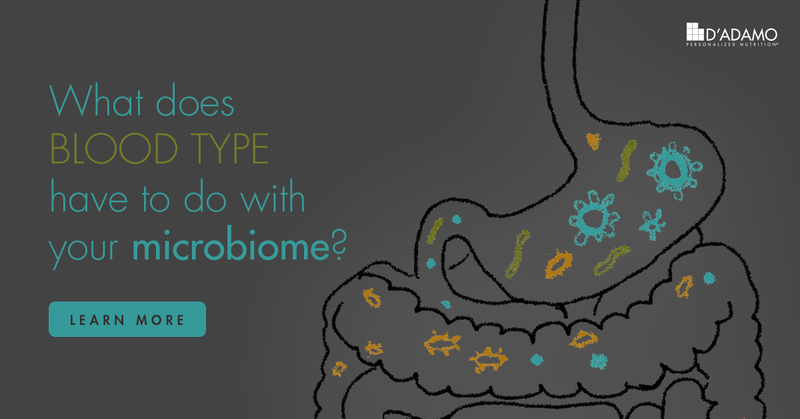 Because of this, many of the bacteria in your digestive tract actually use your blood type as a preferred food supply. In fact, blood group specificity is common among intestinal bacteria with almost ½ of strains tested showing some blood type A, B, or O specificity. To give you an idea of the magnitude of the blood type influence on intestinal micro flora, it has been estimated that someone with blood type B will have up to 50,000 times more of some strains of friendly bacteria than either blood type A or O individuals. Second, some strains of beneficial bacteria actually can have lectin-like hemagglutinin activity directed against your blood type, so avoiding those is a good idea. Polyflora Blood Type Specific Probiotics [ O | A | B | AB ] also blend "prebiotics" (foods which provide special growth factors for probiotic bacteria) that are right for each type. Yes, I recommend that you take probiotics daily. Even using strains of friendly bacteria that have a great ability to survive digestion and colonize your digestive tract, there is a tendency for a gradual decline in the quantity of these bacteria over time. This decline is substantially worsened with stress, poor dietary choices, antibiotics and other drugs. In today's world, with all of its modern pressures, the ability to maintain an optimal intestinal microbial balance is almost always taxed. It has also actually been estimated that we consume 1 million times LESS healthy bacteria in our diet today than our ancient ancestors consumed. Regular use of probiotics has shown to restore intestinal balance, which results in prevention of the adherence of unwanted microorganisms, the production of a wide array of antibacterial and antifungal compounds, and improved resistance against bacteria like E.coli, Salmonella, and H. pylori. Researchers studying the human microbiome have found that your gut flora plays an important role in every aspect of your health – from brain function to weight gain. They've discovered that the "good" bacteria in your gut feed on your blood type sugars as a preferred food supply. 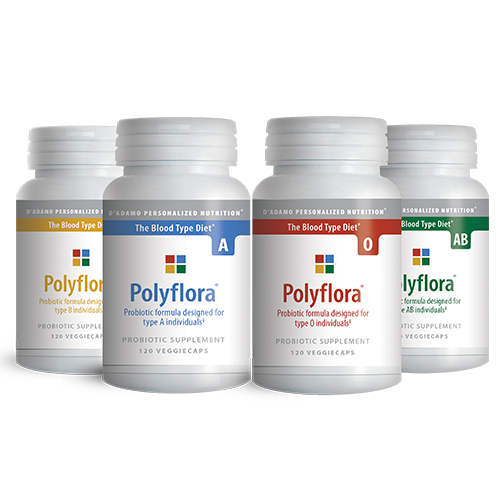 Our unique Polyflora blends blood type specific prebiotics with probiotics to maximize your friendly-flora potential. If you are looking to improve the health of your gut and your microbiome, ARA 6 is an essential element in your health protocol. 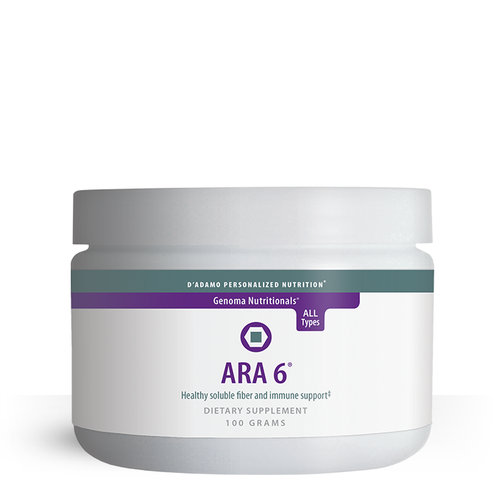 In addition to its immune-enhancing effects, ARA 6 is a natural source of soluble fiber that promotes colon health, and it acts as a prebiotic food supply for gut microfloral balance. 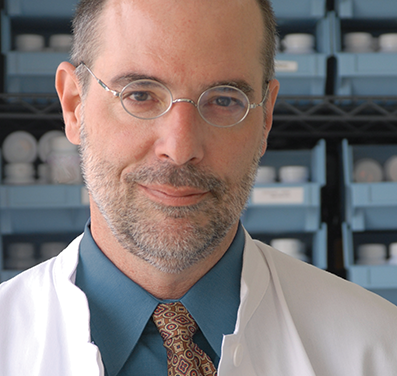 ARA 6 was the first product developed for the consumer market by Dr. Peter D'Adamo, as he was tasked as the initial researcher on its efficacy for clinical use back in the early 1990's. It is good for all blood types and it mixes easily in liquids, which makes it ideal for children or for those individuals who have problems swallowing pills. 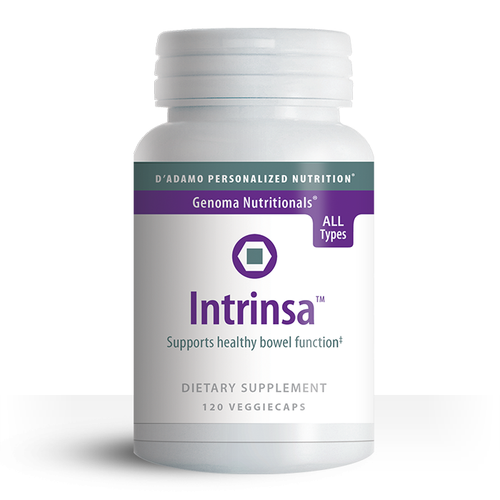 Supports stomach, small intestine, and colon health. This terrific combination of Butyric Acid and Caprylic Acid ensures the latter is absorbed from the intestines and carried by blood lipids to support stomach, intestine, and colon health. In addition, butyric acid, a short-chain fatty acid supports the health of the lining of the small and large intestine. Promotes stomach and intestinal health. Occasional heartburn or bloating seems to come with modern living. 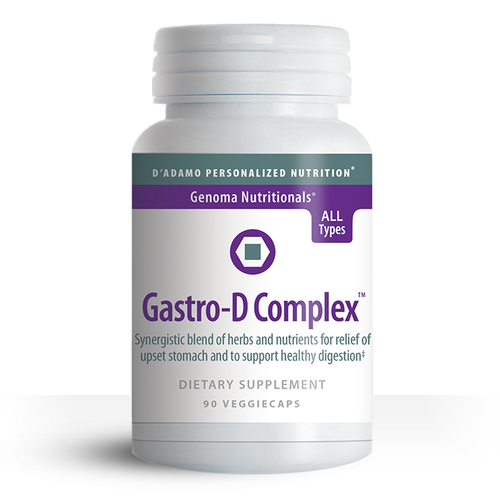 For those simple problems that result from over-indulgence or stressful eating, Gastro-D Complex can be a very useful addition to your supplement protocol. Formulated by Dr. D'Adamo, Gastro-D Complex contains Deglycyrrhizinated Licorice (DGL), Mastic Gum, Safflower Tops, Slippery Elm, and Bismuth, a unique combination of herbs and minerals designed to soothe and calm that upset stomach. 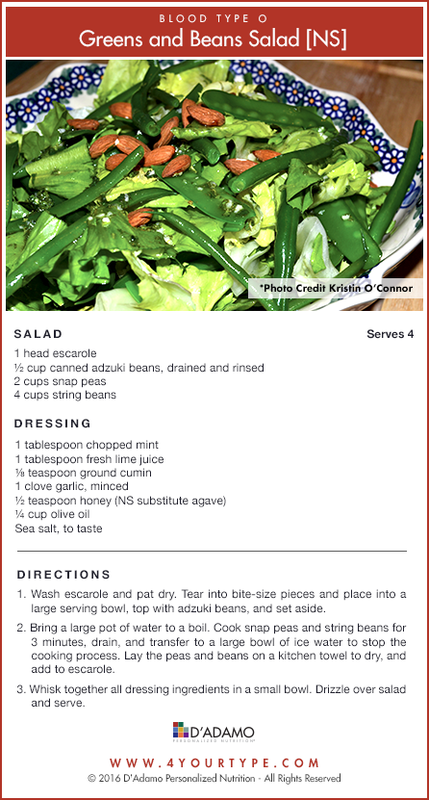 With all the great fresh greens and vegetables available this time of year, we wanted to highlight a delicious, blood type specific summer salad. Each salad shares some ingredients, so you can use it as a base for mixed blood type dining.